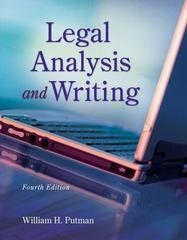 Legal Analysis and Writing 4 Edition LEGAL ANALYSIS AND WRITING, 4TH EDITION helps you analyze statutes and case law and draft legal memoranda. In addition to the fundamentals of good writing, legal or otherwise, the book illustrates how to analyze and brief cases, identify key facts and legal issues, and apply case law and counteranalysis to legal matters. Going beyond mere explanations, the book shows you how to apply concepts to hypothetical situations, draft legal memoranda and correspondence, and scrutinize legal citations and Web research to develop a thorough understanding of the analytical and writing responsibilities you will undertake as a paralegal. Legal Analysis and Writing, 4th Edition is a robust resource that includes a host of available supplemental tools designed to enhance learning.